Blizzard fixed this in Patch 1.25b: Widescreen (stretched) resolutions should now be available in the Video options. Blizzard Entertainment forgot for 7 years to patch Warcraft III - Reign of Chaos and Warcraft III - The Frozen Throne to list all supported resolutions in the options pane when running on Windows (all versions). Instead, when running on OSX, all resolutions are available (including wide screen). That's just not fair. The solution is easy for some, complicated for others: edit "reswidth" and "resheight" in the registry at [HKEY_CURRENT_USER\Software\Blizzard Entertainment\Warcraft III\Video]. Search Google and you will find a lot of apps/utilities to do it for you, but some of them require you to install some version of .net platform (Foole's WC3 Resolution Changer), while others incorrectly list the available display modes (or not at all). There is however an app that will detect the correct resolutions (w3changer), but it has an ugly 16x16 icon (despite its pretty interface), no game launch button and no current resolution detection. You will also find tutorials (for example www.overclock.net or www.techsupportforum.com or widescreengamingforum.com) that expect you to follow the lengthly steps of editing the registry every time the game resets the resolution back to 640x480 (after making any changes in the options section). Now everytime you want to play, just double click the shortcut, and choose between "Warcraft III - Reign of Chaos" and "Warcraft III - The Frozen Throne". 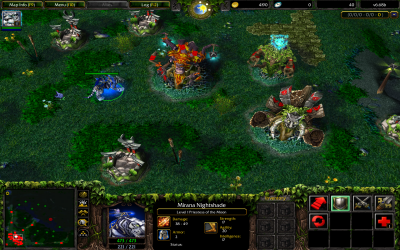 And yes, these work with DoTA Allstars, and all the other custom maps in Warcraft III. To check if you are running at the resolution you want (should be the one the program shows you as default), just look closely at the 3D renderings during play. Not at the menus, not in the options/video pane, and not at the game UI during play. Just the 3D world. Maybe for you. But for the average user, mistakes can happen (forgetting to click on decimal), or the game could reset the resolution after making changes in the options dialog. Therefor an app with an automated solution is definitely simpler, while for you, the two are maybe equivalent in complexity. ty very much!! both for this and the RA2 fix app! It still stretches the 3D world for me. Any ideas why? Is your current screen resolution (before you enter the game) the native monitor one? And is it the same resolution you choose in this program? Note that the game UI (buttons, minimap, progress indicator, build queue, etc.) will stretch because the game does not adapt those to widescreen. Only the 3D stuff adapts (units, map size on screen, etc). It's on the application picture and in the setup instructions, first line. I tried this and I have seen no problems. Good work! That's a little weird, it worked on way too many comps so far. Try uninstalling and reinstalling the game (maybe even Windows). same thing happened to me... it runs only chaos but not the frozen throne... I'll install again the games and I'll post again..! i have to say that my laptop is pretty new.. Asus G53 and I've upgrade the windows till' today ! let's hope it's gone work... ! on the chaos version it's great to see it widecreen anway ! finger crossed ! I have one question though. what is the main difference between the graphics optiion? DirectX and OpenGL - i have run the both, but it seems like they act the same? It's makes a world of difference. DirectX is only available on Windows and is Microsoft proprietary. If you run the game in Wine on Linux, you need OpenGL. Where is the dl button! Did you at least read the instructions? They contain the download....link. thanks, it works well and easy to use the tool.! Thanks . its really works !! Good Job! Thanks for the help! Hi, the 3D still stretches. Did I miss anything? Google resized all original pics into that size. I will "unfix" it soon. Hi thanks for this works great for me on WC3 & FT. Just one thing should the resolution you choose be as close to your native resolution as possible as opposed to just choosing the highest res. Okay, I have a problem. I want to play WC3 in my 1920x1080 however when I try to activate the file with Garena it plays it in terrible resolution. Any answers? Because I cannot find an answer on the Garena forums. Great, working! Thanks a lot! 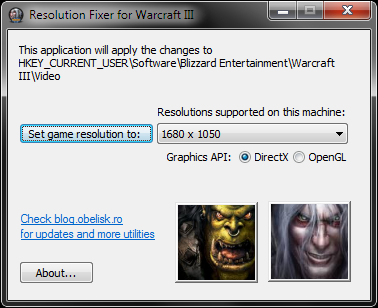 Do not go through in-game video options after using this software, or Warcraft 3 will reset the resolution back to the lowest available. I don't know of an LCD TV good for RTS gaming. They never don't look good when sitting too close. Copyright obelisk.ro. You are not allowed to reproduce this content without prior author consent. Powered by Blogger.